An obviously intoxicated Edd Byrnes took the WoF’s host’s role during this rarely-seen pilot. God, look how sweaty he is. 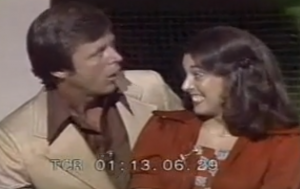 The story goes that Edd Byrnes, known for his role on the show 77 Sunset Strip, was selected to host the second and third pilots of this new game show known as Wheel of Fortune, in 1974. The first pilot, working under the name Shopper’s Bazaar, was hosted by Chuck Woolery (who would later go on to host the show for 7 years). According to Come on Down!!! : The Game Show Book, creator Merv Griffin chose Woolery to host the show over Edd Byrnes because he overheard Edd backstage reciting the vowels “A, E, I, O, U” in an effort to memorize them. Way to go, Edd. You almost gave that poor girl a heart attack. You can watch the full pilot over at DailyMotion.